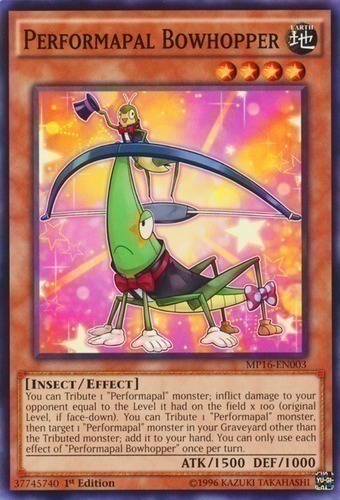 You can Tribute 1 "Performapal" monster; inflict damage to your opponent equal to the Level it had on the field x 100 (original Level, if face-down). You can Tribute 1 "Performapal" monster, then target 1 "Performapal" monster in your Graveyard other than the Tributed monster; add it to your hand. You can only use each effect of "Performapal Bowhopper" once per turn.